Hot diggity dog, Julie! Thank you for having me as a guest on your blog today. I’m a happy tail-waggin’ dawg to be here to share my story with your readers. That is because on Easter Sunday three years ago I did a not-so-smart thing. I tried to jump up onto a container and it tipped over. When I hit the ground I felt my back legs tingle, and then all of a sudden I could not feel them at all. I was really scared. I was staying at a kennel when I hurt myself. My mom and papa were on vacation in Florida. My aunt Lori came to pick me up and take me to the vet’s office. Big bummer. I remember the vet, Dr. Q, calling my mom to tell her I was in bad shape. I then heard my mom crying. I didn’t mean to make her cry. My aunt Lori took me to a hospital in a big city where I had surgery. It wasn’t so bad. It was like I was sleeping and dreaming about all my favorite things. When I woke up there were lots of strangers around, but they were very nice. They took very good care of me. Two days later my mom came to get me. I was soooo happpyyyyy! I know my mom really wanted me to walk again on my own. I tried really, really hard, but it just was not meant to be. I remember one day my mom started crying. She was feeling sorry for me. So I put my best paw forward and showed her I was still me. I had not changed one bit. I just would need a little extra help. That’s all. Mom took me outside and I cooperated as she put me in the wheelchair. Hmmm, I wondered. Now what do I do? I thought maybe there was a motor with my wheels, and it would take me down the road. I looked behind me. Nope, no motor. Then my mom said, “Run free Frankie, I know you can do it!” “You mean I have to operate this thing?” I thought to myself. I have a bit of stubbornness in me. It must be because I am German. At any rate, mom ran in the house. The next thing I see is Mom placing my favorite treats down the sidewalk! Why is she doing that, I wondered. I just couldn’t let those treats sit there! Hey, wait a minute, I’m moving! This thing I am in really does work! From that day on nothing has stopped me from doing all the same things I did before. I chase bunnies, tease squirrels, try to jump for butterflies, bark at the neighbor dogs, and go on walks with my big lab sister, Kylie. I can even take a nap on my favorite bed while I have my wheels on. One of my FAVORITE things to do is visit schools where I live! I never got to do that before I had my wheels. I show kids how I can twirl around in my cart and how I am still me even though I have tires to help me get around. They think I’m pretty cool. I also became a therapy dog! I visit a senior assisted facility, the hospital and hospice patients. So, that is how I got my title, “The Walk ‘N Roll Dog.” It is one of the best things that have ever happened to me! I’ve met so many kind and compassionate people by sharing my story. The best part is everyday mom gives me at least 1,000 kisses and tons of hugs. She is very proud of me. I must say, I’m proud to be “The Walk ‘N Roll Dog” and show others that anything is possible. So never give up hope! And oh, one more thing! In February 2009 I was inducted into the Wisconsin Pet Hall of Fame. I was chosen because my mom and I are bringing a positive face and voice to animals with disabilities. Now that makes my heart smile. ARF-A-ROO!! A big thanks goes out to Frankie and his mom Barbara Gail Techel for providing me with this very inspiring guest post! As a dog lover and a big crybaby, I loved that post - it brought tears to my eyes. 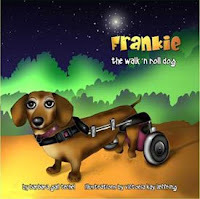 Thank you, Julie for letting Frankie tell her story on your blog today. She wants you to know it was one of her favorite things ever! I sure got a kick out of her thoughts... she's a unbelievably wonderful dog. I'm so blessed God entrusted her care to me.